Purchased on funds from the Frances L. Koltun Bequest, 2011. The parent codex: according to its colophon ("Hoc opus scriptum notatum ac miniatum fuit penna et pennello Cremone. per me Ludovicum de gaçis civem Cremonensem. Cuius operis institutor fuit R[evere]ndus p[ate]r Sacre Theologie professor Magist[er] Franciscus de Bolzano ordinis minor[um] pro usu conventus cividalis Bellone. 1.4.8.9. Die X⁰ Aprilis"), the so-called Belluno Gradual was commissioned by the Reverend Father Franciscus de Bolzano of the minorite [Franciscan] order and professor of Sacred Theology, for the [Franciscan] convent of San Pietro at Belluno [about 65 miles north of Venice] at Cremona from Lodovico de Gacis, citizen of Cremona, by whom the work was written, provided with music, and decorated with pen and brush, 10 April 1489; the princes of Stolberg-Wernigerode, at Schloss Wernigerode (their codex 40), until the late nineteenth century; Kurt Arnhold (1887-1951) (his MS 36); sold to New York, Kraus and Schab; New York, H.P. Kraus, Catalogue 88, , no. 46; bought by Mark Lansburgh, originally Santa Barbara, later Colorado Springs, in 1959 (de Ricci Supplement, 1962, 25, no. 5); the codex was dismembered by 1969. This leaf: New York, Inman's Book Shop, Catalogue no. 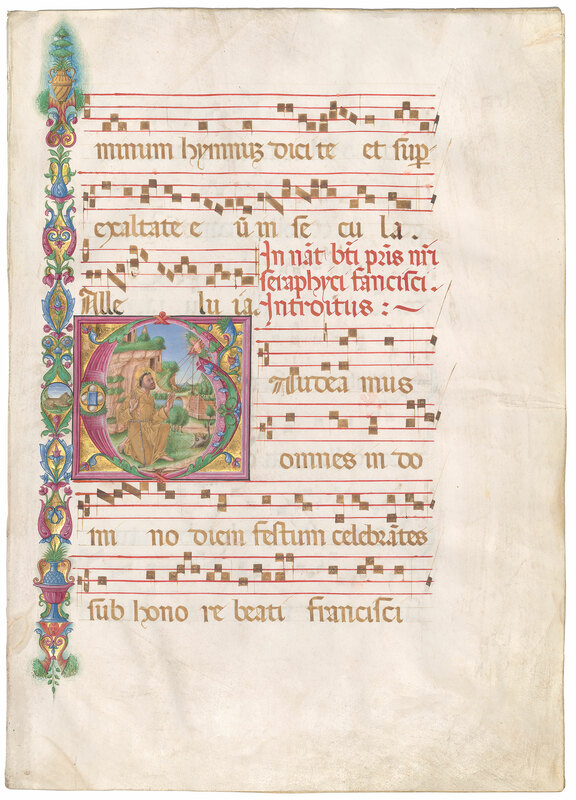 110 (Illuminated Manuscript Leaves on Vellum from an Italian 15th Century Gradual Written and Illuminated by Ludovicum de Gacis at Cremona, 1489), , no. 11; Ladislaus Von Hoffmann, Washington, D.C.; his sale, London, Christie's, 6 July 2011 (The Arcana Collection: Exceptional Illuminated Manuscripts, Part III), lot 6; bought by the Morgan. The Morgan's historiated initial of St. Francis is one of thirteen originally in the parent codex. A leaf with an initial of Sts. Peter and Paul is today in Washington, National Gallery of Art, Lessing J. Rosenwald Collection (Carra Ferguson et al., Medieval & Renaissance Miniatures from the National Gallery of Art, Washington, 1975, 84-87, no. 24). Texts: Folio LXIIIr-v: end of the Feast of the Dedication of St. Michael the Archangel (September 29) and beginning of the Feast of St. Francis of Assisi (October 4) [The "Gaudeamus" Introit, not used in today's liturgy, can be found in such fifteenth-century Missals as Morgan's MS M.374, f. 144, and MS M.95, f. 236v]. Folio LXVIIIr-v: end of the Feast of St. Martin of Tours (November 11), Feast of St. Cecilia (November 22), Feast of St. Clement (November 23), and rubric for a Mass against Plague. Decoration: 1 historiated initial (Stigmatization of St. Francis) and 1 historiated border. Artist: collaborator of Ludovico de Gacis (Thieme/Becker, XIII, 23; D'Ancona-Aeschlimann, Dictionnaire des miniaturistes, 1949, 81; Bollati, Dizionario, 2004, 248-51).